Updated snow totals, Jan. 23, 2016. (Credit: NWS) Click to expand. A hurricane force wind warning has been issued for coastal areas of Ocean County, the National Weather Service office in Mount Holly announced in a briefing package issued Saturday. Strong northeast winds gusting over 60 mph are expected near the coast through Saturday, the package said, but hurricane force winds – over 74 m.p.h. – may be felt on coastal waters. “On the coastal waters, strong northeast winds gusting up to 65 knots are expected,” the briefing said. 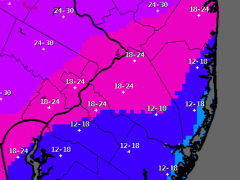 On the snow front, predicted totals have been upped again by forecasters, who now say another 7-12 inches will fall in central New Jersey before the storm departs overnight between Saturday and Sunday. Wet snow is expected at the coast while more powdery snow is expected in North Jersey and western areas of South Jersey. Flood tides are still expected to continue through Sunday morning. “Expect widespread coastal and back bay flooding with property damage and road closures,” the briefing said. 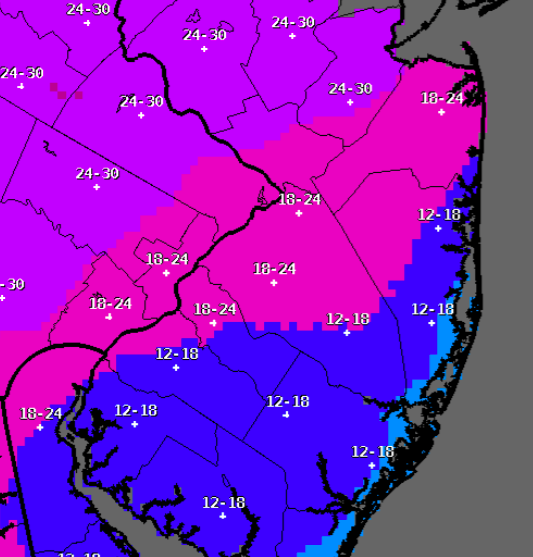 The vast majority of Ocean County is expected to receive a total of 12-18 inches of snow.